Explanation: Also known by the popular name the "Little Dumbbell Nebula", M76 is one of the fainter objects listed in Charles Messier's 18th century Catalog of Nebulae and Star Clusters. 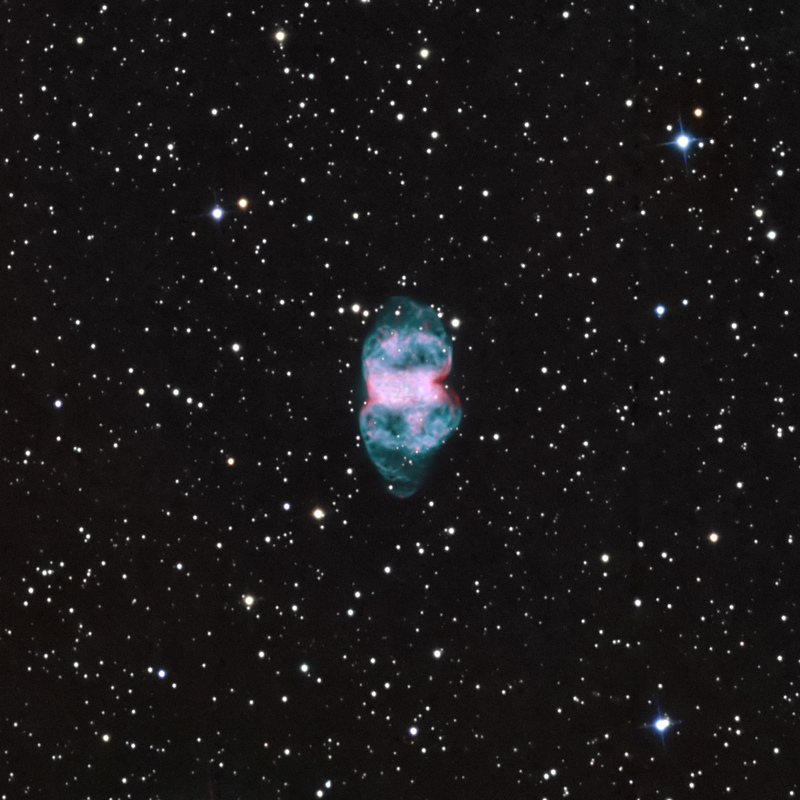 Like its better-known namesake M27 (the Dumbbell Nebula), M76 is recognized as a planetary nebula - a gaseous shroud cast off by a dying sunlike star. The nebula itself is thought to be shaped more like a donut, its central box-like appearance due to our nearly edge-on view. Gas expanding more rapidly away from the donut hole produces the more extensive, far flung material in this remarkable image that uses narrow-band filters to highlight the emission from hydrogen (in red) and oxygen atoms (in greenish blue). In particular, complex oxygen emission features are seen above and below the main nebula to a degree not detected in most images of M76. Distance estimates place M76 about 3 to 5 thousand light-years away toward the heroic constellation Perseus, making the nebula over a light-year in diameter.